Friday is fish day - Stop staring and start sewing! 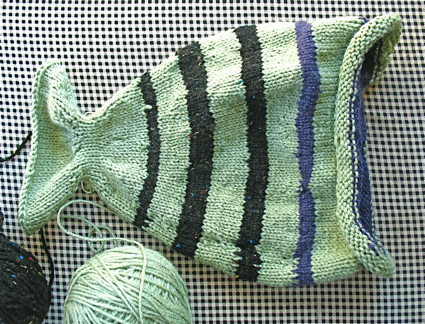 Well Joey's getting close to finishing his first major knitting project and it's looking really cute! Here's the site where he got the idea (see, it's a fish!). I think he's contemplating a sweater (for me!) next. I'm trying hard to keep my hands off of the Sweet fabric because I know it's popular and I'm not supposed to hoard it for myself anyway but I had to play with a little (just to get it out of my system). 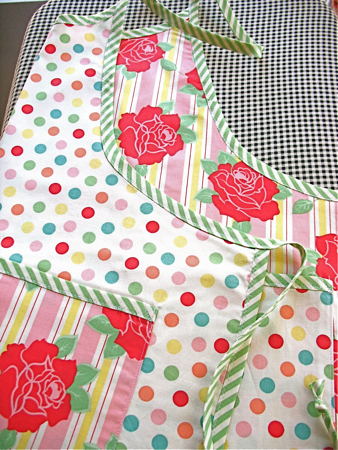 I'm really obsessed with this reversible apron pattern (to the point that it's keeping me up at night). I might even make one to keep at some point (this one's going in the store)! Be sure to run over to Happy Zombie and see what Monica is doing with this fabric! Cute times ten!! And I was so excited to find the ingredients for my next quilt block assignment in the mailbox today. 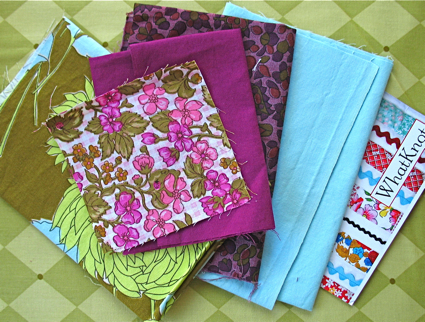 These are the fabrics from Melissa at WhatKnot. I love them!! I think I'm going to add a little of Patty Young's Andalucia Jester fabric to it. And there's a designer with a new collection coming real soon and you should run over and take a look! I've been a fan of Bari J. for a long time and when I was in Houston for Quilt Market I recognized her by her purse (she was in line in front of me and her purses are truly exquisite). I was thrilled to be able to spend some time chatting with her and found out she was going to meet with some of the manufacturers about creating a line of fabric. She went home with a contract and is finally giving a peek on her blog. I will confess she already let me see it and I've already ordered the whole line! It's being released by Windham and they make some of the softest fabric out there. Did you notice my new blog colors? Joey told me about this great site called Kuler and you can "create" your own colors and then get the html number and use it on your blog or site or whatever (it will even save your color combos for you). Or you can just sit there for hours playing with it while your kids tear the house apart (like me!). Super fun! And here's a sample from my busy day today: I was driving with all 5 kids in the car and from the backseat I hear Sofia, sounding quite irritated, say to her 8 year old brother, "Will you stop showing me your ear wax!". His reply was "Look how big it is!". Sigh. I'm so glad I get to sit up front and drive.